In that case, dashing musician, vaudevillian and raconteur Ukulele Loki must be swimming in a fair amount of soupy goodness. The Boulder-based Loki, nee Aaron Johnson, is ringleader of the Folderol Follies, a show that is equal parts burlesque, vaudeville and circus. As his moniker suggests, with trusty ukulele in hand, Loki guides audiences through performances by rock ’em, sock ’em, classic burlesque artist Orchid Mei; comedy, tap dance and vaudeville routines by Miss Petunia; daredevilry by 3-foot-3-inch Little Miss Firefly, the world’s smallest fire-breathing midget; and breathtaking numbers by renowned aerialists of the Oracle Dance Troupe. 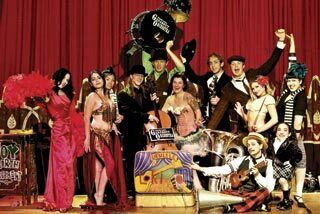 Folderol Follies employs a modern twist on old forms of entertainment, an idea borne from a love of all things “olde tyme.” Loki credits his grandmother for his fascination with 1920s and ’30s-era entertainment and style. But don’t mistake this for some sort of attempt at retro coolness. Loki, donning clothes that could have been raided from Grandpa’s closet, seems entirely sincere. “A lot of people assume that because I’m into vaudeville and because I play the ukulele, that what I’m doing is a recreation of corny, ’20s string-band music; but I grew up on New Wave, early death-rock, post punk music. I think what I do is equally informed by Joy Division as much as it is Gus Kahn and the Gershwins,” he says. After being asked to M.C. a few burlesque shows in Denver — including one for contemporary pin-up queen, Dita Von Teese — Loki created his own show of shows. With girlfriend Yuka Takeda (melodica, glockenspiel), Ben Fauch (tuba), Phil Norman (cello) and Davis Wimberly (drums), Loki has formed The Gadabout Orchestra. The group, fusing acoustic, central European, indie-rock and hot jazz in a manner most peculiar, is currently recording an album. Loki points to an acoustic-instrument renaissance as his springboard. “Back in 2000, when I said that I wanted to write acoustic, moody, dark, sentimental love songs informed by The Cure and Tin Pan Alley, no one got it. Now they do, it seems,” he says. Directing burlesque and vaudeville shows is all well and good, but the core of Loki’s intrigue lies smack dab in the center of his face: an expertly groomed and waxed mustache, curling just so at the tips. He started growing the facial hair in 2000, with a pencil-thin mustache. Alas, being fair-haired, his dreams for a “crushingly handsome, dark and swarthy, thin, 1930s mustache” just weren’t going to come true. Instead, he curled his up at the sides. Naturally, Loki did what any socially conscious, mustachioed man would do: He started a club, the Hirsute Moustache and Beard Grower Society (HuMBuGS), which plans to host the second annual Beard and Moustache Bash in March, an event for all, including females and fakers. But there is a downside to being so follically debonair.